Potential buyers would often look for houses on nights and weekends. If you are not available to answer their call, they will look elsewhere. Save precious time answering phone calls by providing information about your apartment right there on the spot. Keep track of all leads. Our system captures name and phone number of every person that inquires about your property. You can follow-up immediately while the prospect is still there. Or you can call them at your convenience while keeping a database of potential buyers or tenants. Try our service for $1. Cancel anytime. Includes 1 reusable code with unlimited listings and 50 message credits every month. Send a text message with code 1000 to number (800) 960-5229 to see sample response and property page. The buyer drives past your "For Sale" sign and sign rider. The buyer sends a text message to the number on the sign with the unique campaign code. The buyer instantly receives a text message that has the property details and a link to the single property website. The buyer pulls up the single property website on their phone to view pictures of the home. 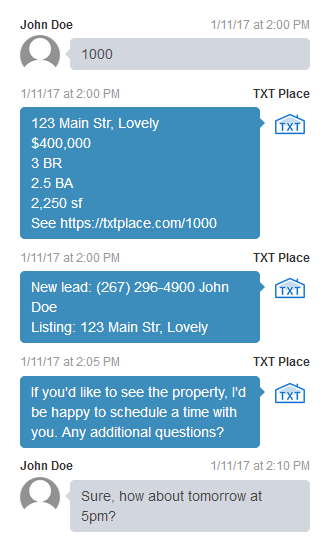 Agent instantly receives the buyer's name and phone number via text message or email and calls back to see if they'd like a showing. Our system lets you provide detailed information about your listing while prospective buyer or tenant is right there on the spot and collect their name and cell phone number. Sign riders or freestanding signs with colors matching your brand. Signs with unique codes can be reused for different properties. Mobile-friendly property pages with photos, details, map and contact form. See sample property page. Use QR code on a sign or in a publication to promote your listing. Know who is requesting information about your listings. Our system will look up names of all leads. Be notified about new leads via email and text messages on your schedule. Call, email or text them back right away while they are still near the property. 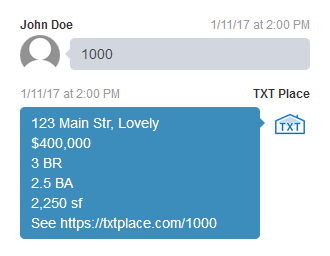 Send customized text message with a delay after the lead receives property information and a link to property page. Filter leads by listing and export data in MS Excel format. Invite other agents within your real estate office to access and manage their own listings and campaigns. Traffic encryption over HTTPS protocol. Data is hosted in secure and 24/7 monitored environment. Now you can keep your unique reusable codes even during slow periods. Each plan includes a number of free message credits every month. One message credit allows us to send or receive a short text message on your behalf. You only pay for text messages above your free message credits at the per-message rate. Select a plan and sign up in no time. You can always add more codes after you sign up.